Well, it’s another shoe review. That’s what, two in two weeks? Meermin has been making major waves in the menswear scene lately. A few weeks ago I got in touch with Pepe Albaladejo in Mallorca and he was kind enough to send me a pair of double monkstraps and to give me an interview. Here are the results. First a little about the brand. Albaladejo is adamant that value is the heart of what Meermin is about. 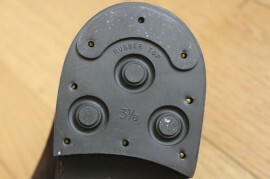 “We have been in the shoemaking always. Our family has a long shoemaking tradition. 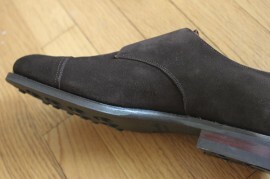 We saw that there is a need in the market of quality shoes, but usually they are very expensive. 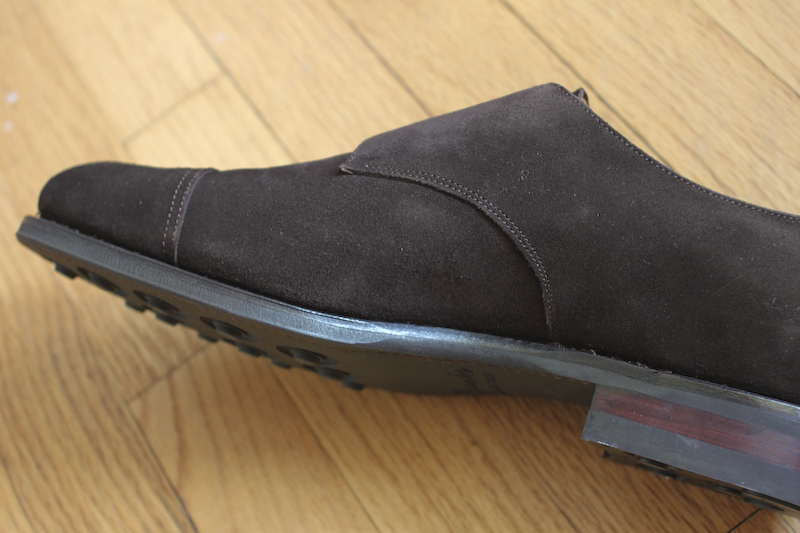 We started Meermin with the aim of changing the concept of high quality shoes. Find the way of offering high quality shoes at the best value for the customer.” Sounds promising, no? Prices may seem shocking when you first look. These suede double monks are 150 Euros including VAT, which is low enough to engender a little skepticism. But at first glance, Meermin really does deliver some of the best value I have seen. The construction is solid all the way around. 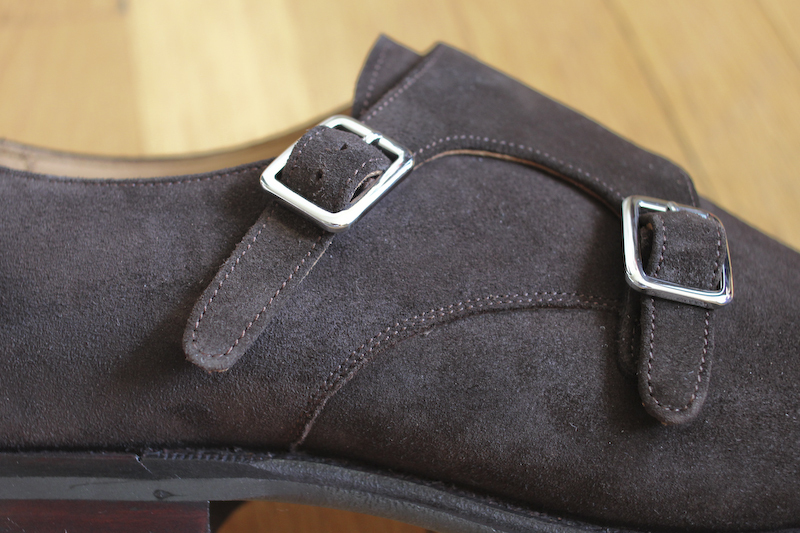 Good welting, a solid faux-Dainite sole, non-tinny buckles, and top quality suede provide a good foundation. In fact, the suede is from Charles F. Stead, who also supply makers like Alden. 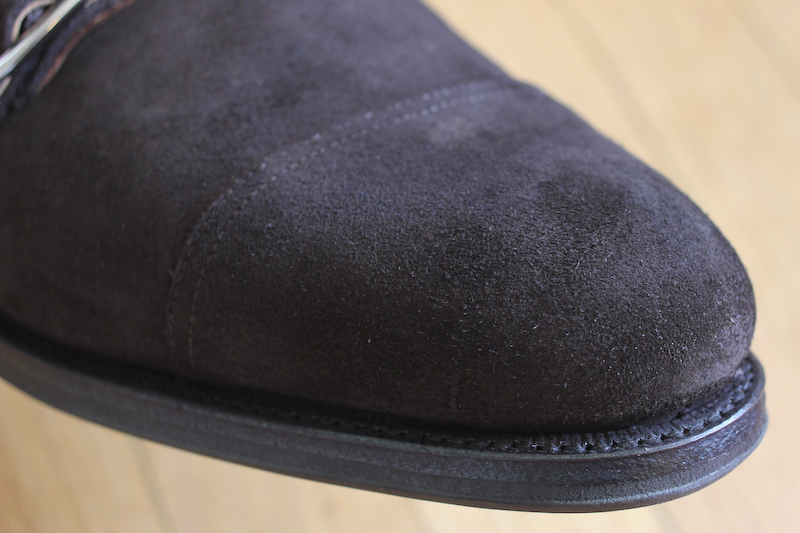 “Since we have always been in shoemaking,” says Albaladejo, “we are pretty well connected with the material suppliers/producers and we can get better prices for high volume purchases,” which is how they do it. A very impressive beginning for shoes at this price range. The toe puff feels sturdy (a place where lesser brands often skimp), the lining leather is smooth and consistent, and overall I’m very happy with the fit. I’m an 8 1/2 US, and sometimes I need a narrow, so when Albaladejo told me to go with a straight up UK 8, I was a little worried. But he knows his product and his customers and did a great job service wide. There were even some FedEx issues and he handled them like a champion. Like with the Ed Et Al shoes I reviewed last week, I’m going to wear these around the next few weeks and report back on how they wear. Trees are not included, so I’ll have to pick some up, but at this price I really can’t complain. I anticipate good things, but how the soles wear, durability of the straps, and suede durability all take time to fully figure out. The double monkstraps I chose might be the most popular option right now, but they will do made to order shoes, letting you select “style, last, upper leather, lining leather, sole option, sole finishing, construction…currently the expected production time is about 12-14 weeks.” I’m not wild about all of the lasts, which you can see above, but the Hiro used on my monks, the Ama, and the Olfe are all very appealing. It’s a matter of taste, so I’d rather have more options than too few. It’s certainly a perk that Meermin offers a few construction and materials grades, so you can really get what you want and put money into the things that matter for you. If you really want hand welting, fine. If you want shell cordovan, go for that. I can’t speak to the quality of each individual option and product line, but it’s admirable that Meermin wants to give customers value without forfeiting control. Finally, there has been a lot of buzz about Meermin’s relationship with Carmina. Albaladejo assures me that the connection is exclusively familial – different branches of the same family own and operate both, but they share no facilities, staff, or designs. No more ambiguity guys, sorry to the conspiracy theorists. 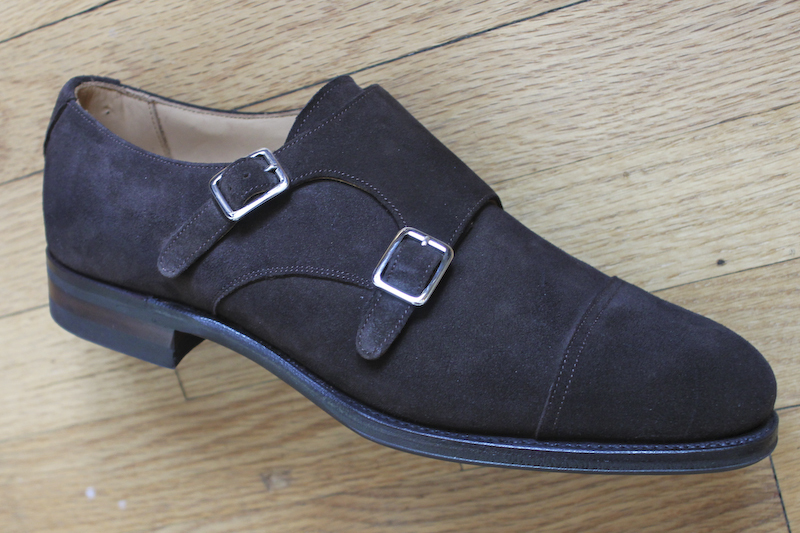 Also check out the Meermin tumblr for some great shots of the shoes. I also enjoy the updates. Well done as usual. I’ve been wearing mine for awhile. I find them to be well made and comfortable. Unfortunately, I should’ve sized down but I chalk this up to user error. I’m sure you’ll enjoy them over the years. Keep up the good work. 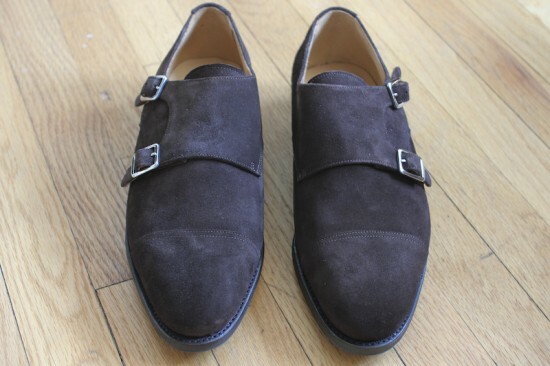 The dark brown suede is great. Makes the shoes less conspicuous than other monkstraps. Funny enough, I’m wearing my Meermin semi-brogue captoes for the first time today. Well made and the fit is good. Very happy with the service as well, from both Pepe and Sandro. Thanks for the informative initial review, Stephen. I had the chance to speak with somebody very connected with the Carmina/Meermin bunch this evening. I asked him what he knew with regards to the connection. By request, I am leaving his name and position off the record. As stated, Carmina and Meermin are strictly tied along familial lines. There is no working relationship between the two. Carmina’s lines are obviously fully produced in Spain, etc. 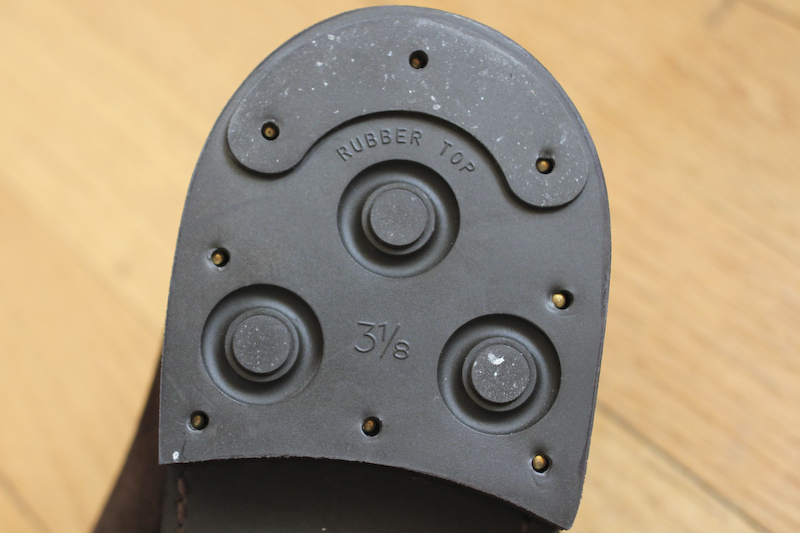 Meermin’s shoes are manufactured in China and “finished” in Spain. The shell cordovan used is not Horween, but comes from an Argentinian shell producer. 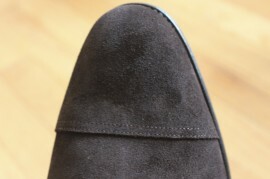 The quality of the Meermin’s are good, but labor process and the materials used are not to the same level as Carmina. These are great! 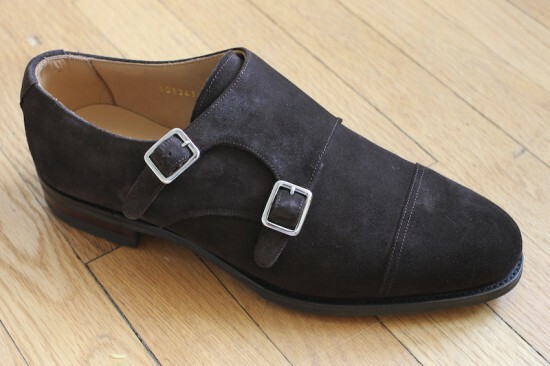 I have also been looking at these Fryes here at http://www.genuinegents.com/frye-mens-james-wingtip-oxford/ Thinking of picking up some monks though. Great article as usual! I read somewhere that these shoes are largely made in China but “finished” in Spain. I’m curious how the shipping costs are. The site IS a little tricky to navigate, what with the Spanish! Thanks for a great review. It would be really interesting if you would like to follow up your initial comments above, with some second opinions now when you had the shoes for half a year.